Topics: Konica Minolta New Dslr Photos, and Epson Fact Sheet. 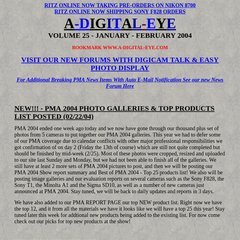 a-digital-eye.com A-Digital-Eye.com - All about digital photography including new .. It has 2 DNS records, dns1.midphase.com, and dns2.midphase.com. Its IP Number is 174.127.108.211. PING (174.127.108.211) 56(84) bytes of data. A ping to the server is timed at 54.7 ms, and the average page load time is 3821 milliseconds.